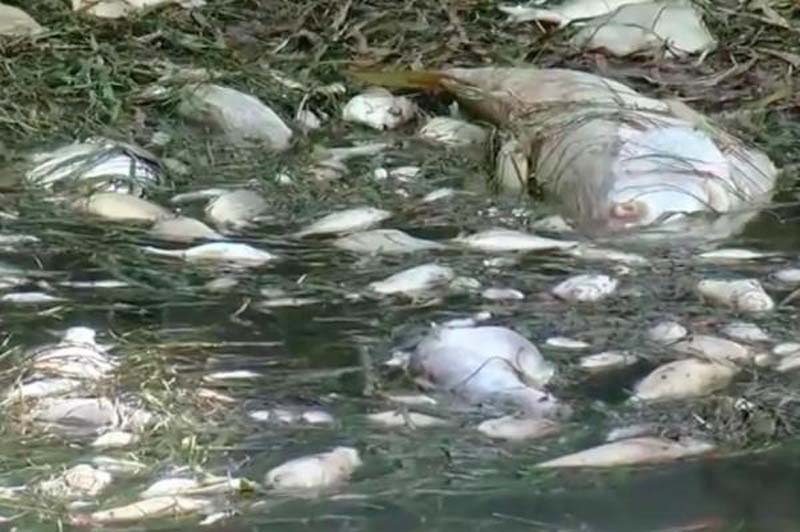 Dead marine life, including fish and sea turtles, washing ashore represents one of many problems facing Floridians as a red tide worsens along the state's southwest coast. Scientists say the phenomenon that began a few months ago is not going away anytime soon, leaving residents and government officials heartbroken over the loss of sea creatures and scrambling to deal with clean-up efforts, the Fort Myers News-Press reported. The red tide bloom, which naturally occurs in the Gulf of Mexico, is usually small, consisting of scattered colonies with numbers so few no one notices. Water quality experts say the blooms are sometimes fueled by nitrate pollution flowing from over-fertilized yards and leaky septic tanks. Red tide affects air quality, as breaking waves can cause toxins to become airborne in sea spray, causing eye, nose, and throat irritation. [post_ads]Residents hope for offshore winds to push the red tide away but experts say it could be winter before that happens, after water temperatures drop. The Sanibel-Captiva Conservation Foundation said more than 91 sea turtles have been found stranded, including 53 found between June and July. Fifty-eight were dead, while 33 were found alive and taken to the Center for the Rehabilitation of Wildlife clinic for treatment. Allen Foley, with the Florida Fish and Wildlife Conservation Commission, said in a Tampa Bay Times report that so far toxins from the bloom have killed 452 sea turtles, about three times the normal amount for this time of year. The dead include loggerheads, which are threatenedm and endangered Kemp's ridleys or green turtles. The Florida Marine Mammal Pathology Laboratory in St. Petersburg said the bloom is suspected of killing 92 manatees, including 12 in the past week. Along with the red tide, a blue-algae invasion is spoiling miles and miles of other Florida waterways. On Tuesday, commissioners in Martin County, on the state's Atlantic coast, declared a local state of emergency because of the algae situation affecting the St. Lucie River and Indian River Lagoon, according to a WPTV report. The declaration clears the way for grants and mitigation efforts. Martha Kneiss, communications-outreach coordinator for the county, told UPI at least 100 residents attended the commissioners meeting, which along with county staff included representatives from the Department of Environmental Protection, staff members from the offices of senators Marco Rubio and Bill Nelson, and U.S. Rep. Brian Mast, who spoke at the event. "It was a good meeting, we had a full house," Kneiss said. "We had conversations about long term solutions and discussed ways to assist with the clean up efforts." State and federal funds for efforts to protect water have shrunk over the last decade, dwindling work stations down from 350 to 115, according to Florida International University's Southeast Environmental Research Center. Gov. Rick Scott issued a news release earlier this month, saying his administration has spent millions on red-tide research, including $5.5 million awarded to the Mote Marine Laboratory. "With this year's red tide being more substantial than previous years, we must do everything we can to help minimize its harm to our water and wildlife," Scott said. But Public Employees for Environmental Responsibility, a national non-profit alliance of local, state and federal scientists that tracks environmental enforcement, said Florida had its second worst year for enforcement since 1987. "You have to have a monitoring program in place to understand if there's a positive response to the money you spend fighting environmental problems," Florida International University marine ecologist Jim Fourqurean told the Miami Herald.